Welcome to 20 Years On, a series here on VivaLaVidaFM where we take one of the games hottest prospects and see where they end up at the end of their career in Football Manager. In this post, we see where Bayer Leverkusen youngster Leon Bailey could end up in 20 years time. 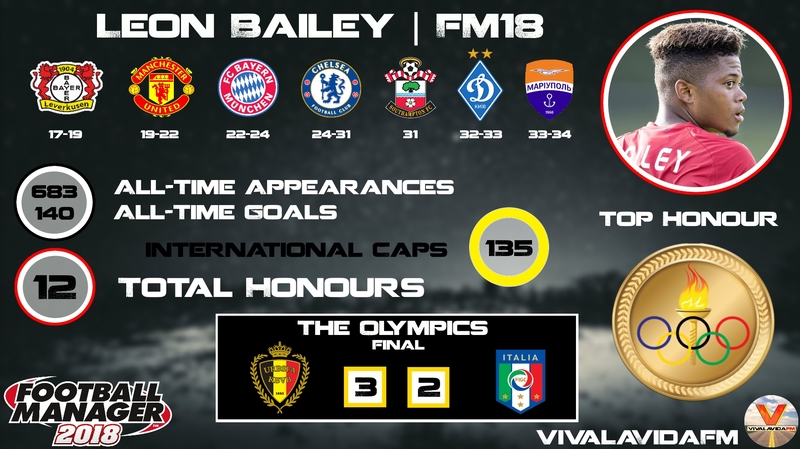 Leon Bailey has had a fascinating start to his football career. The Jamaican-born winger came to Europe to find football as a youngster with his adoptive father. They travelled around Europe and eventually found a club willing to sign Bailey, KRC Genk. The Belgian side signed a draft agreement with Bailey at just 15 years of age, however this is illegal in Belgium. The pair returned to the Caribbean but were not deterred from finding Bailey a club in Europe. Bailey had made a verbal agreement to sign with Ajax but the transfer did not happen and instead the Jamaican signed for Slovakian outfit Trecin. From here, he was then transferred to Genk, where he played over 50 games in two years, before moving to German team Bayer Leverkusen. Like I said – a fascinating start to a career! Bailey begins his FM18 career with a Bayer Leverkusen squad with several high potential players (including Kai Havertz and Benjamin Henrichs). He didn’t stay with Leverkusen for too long, however, as Manchester United came in for the winger in 2019. United paid £57M to sign Bailey and the winger made 155 appearances for the Manchester club. He won just one trophy in his three seasons with United before moving back to Germany to join giants Bayern Munich. Bayern paid a huge £100M to buy Bailey from Man Utd in 2022. Bayern Munich, 2022 Champions League winners, went on to make a profit from Bailey just two years later! And it was a move back to England for Bailey. Chelsea bought Leon Bailey for £102M, meaning that our winger has moved between clubs for £100M or more on two occasions. He made over 250 appearances for Chelsea in his 7 seasons there, scoring 50 goals. He won 7 honours whilst with Chelsea. Bailey joined Southampton on a free transfer in the summer of 2031, but he only made nine appearances before moving on to yet another club! Ukrainian club Dynamo Kyiv signed Bailey for £2.3M in January 2032. Our ageing wide man appeared in 59 games for the club before departing in 2033 to fellow Ukrainians Mariupol. Mariupol turned out to be Bailey’s final club before retiring – who would have said that at the beginning of his career? He played 34 games in his final season of football which highlights how important first-team football was to Bailey, he could easily have sat on the bench for Chelsea for the remainder of his career but he chose to leave in search of regular first-team football. International | Jamaica or Belgium? Leon Bailey starts the FM18 save eligible to play for Jamaica, Belgium and England. In real-life, Bailey has been refusing the Jamaican call-up with his adoptive father’s support. In this save, Bailey chose to represent Belgium and he went on to earn 135 caps for his country. He failed to lead Belgium to any successes either in the World Cup or European Championships, but he did help his side win a gold medal in the 2024 Olympics. This entry was posted in FM Wonderkids | 20 Years On, FM18 Guides, Experiments & Wonderkids, Football Manager 2018 and tagged bayer leverkusen, belgium, europe, fm wonderkids, fm18, football manager, germany, leon bailey. Bookmark the permalink.